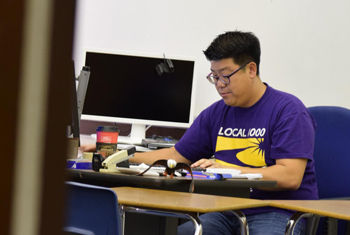 During the recent “Take Back CSD” movement at California School for the Deaf, Fremont, math teacher and CSD Union Representative Sulghi Hong emerged as a grassroots leader. Since 2013, he has represented the interests and concerns of CSD staff. Hong explains that the movement was a joint collaborative effort "between the Association of Families, Teachers, and Counselors, CSD Union, California Association of the Deaf, Bay Area Black Deaf Advocates, Council de Manos, and many other Deaf organizations/community members.” Service Employees International Union Local 1000, which represents around 95,000 State employees, including CSDF and CSD Riverside, and State agencies employing Deaf people, was also involved and supportive. Although “it feels good knowing that we achieved our goal” of getting Superintendent Sean Virnig removed from CSDF, he wishes it could have been accomplished internally. Now that CSDF is searching for a new superintendent, Hong wants the best possible choice for CSDF, one who can “actively collaborate with our staff, families, and community members to bring the very best for our Deaf students,” and to return CSDF to the peak of quality. During Dr. Virnig’s tenure, enrollments dropped alarmingly; a good superintendent will help to reverse this trend. He notes that he’s “fortunate to be working with a wonderful group of people,” and appreciates the support of the California and general Deaf community and hearing allies who “came together and contributed their time, money, food, skills, labor, and/or love for CSD.” The Deaf community is being represented on the search committee. CSDF is back in business, stronger than ever.